The American Dad slot machine is as irreverent and enjoyable as the show is. It features all the main characters, along with plenty of laughs along the way. The game has a lot going for it. There are loads of special features, and they’re triggered in a slightly unusual way to boot. The maximum bet might be a little low but the multiple bonuses on offer make it a worthy title for all those who didn’t want to bet their life savings. Great theme. As it’s a licensed machine, players familiar with the original content will enjoy this one. Stacked with great features. Most of the characters have their own, making this title one with great replay value. Low main game prizes. The highest jackpot that can be awarded during the base game is just 750x the line bet. Low upper betting limit. At just £200 per spin, high rollers will be served better elsewhere. Roger (Wild) = 750x the line bet. Stan = 250x the line bet. Francine = 150x the line bet. Hayley = 100x the line bet. Steve = 75x the line bet. Klaus = 50x the line bet. 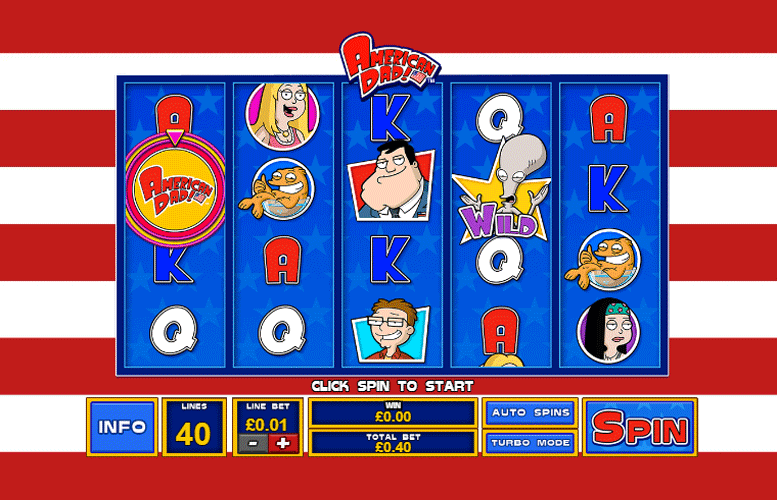 The American Dad slot machine from Playtech has loads of great features for players to enjoy. All the game’s special features are triggered using the American Dad bonus symbol. Players must land it on reels one and three triggers a re-spin and players who are lucky enough to land it on one, three, and five, will receive free games. When either re-spins or free games are triggered, players are given a special character feature which effects the additional spin(s). The American Dad bonus symbol on reel one changes into a “wheel of fortune” style game with all the main characters on it. This spins and determines the bonus received. The symbol on the third reel has numbers on it. This determines how much the bonus feature is powered up. Finally, the symbol on the last reel will only be there whilst triggering free spins. Again, it’s numbered and determines how many free spins the player receives. Players who trigger bonus spins with Stan receive additional stacks of Stan symbols across the reels. The power up wheel for this bonus determines how many Stan symbols will be added per stack. Ever the party animal, Roger the Alien is suffering from over-indulgence again. He appears to vomit “chunky random wilds” on every feature spin. The power up wheel determines how many of these random wilds are added. On Francine’s Holy Grail, players are given 25 free games with additional patches of Klaus symbols appearing on the reels. If the Francine symbol lands in a position with a Klaus patch she becomes an expanding wild. The power up wheel determines how many clusters of Klaus symbols will appear on the reels. Teenage radical daughter Hayley collects signatures for some cause on every feature spin. For every signature she gets, the win multiplier is increased. The power up wheel for this feature determines the initial win multiplier that the feature commences with. This means, players can start with an impressive 10x winnings on every free spin. In a typically madcap moment from the show, Roger and Steve have alter egos – Wheels and the Legman. They chase across the reels leaving a trail of “wilds” on every feature spin. The power up wheel here determines the number of “wilds” that are added on the path. 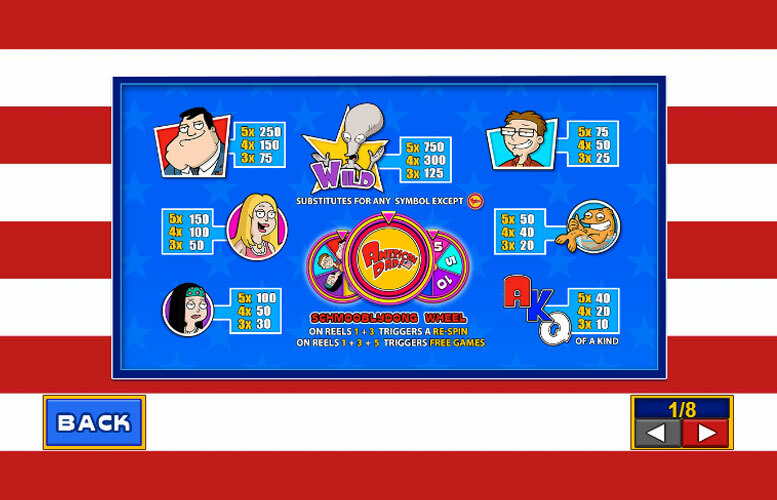 Players can adjust the number of lines played on the American Dad slot machine, as well as the amount bet per line. The lowest stake per line is just 1p, and the highest is a rather underwhelming £5. 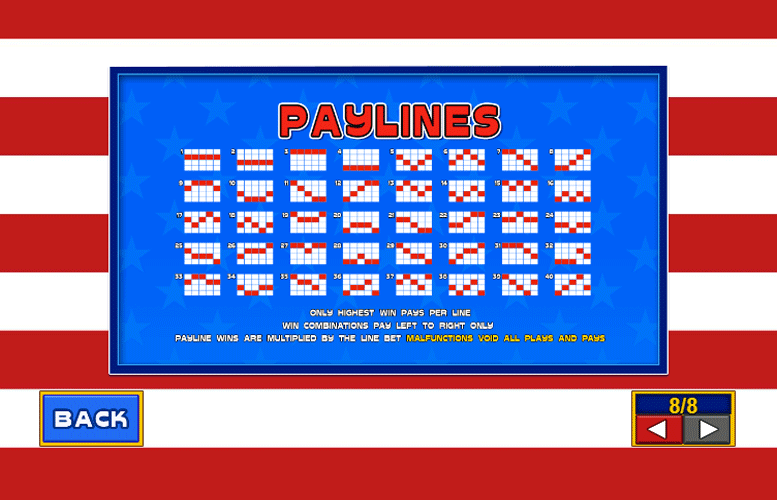 Meanwhile, players can choose between one and 40 lines. This means that when all values are set to their minimum, the cost per spin is just 1p. With all variables set to their upper limit, the maximum bet is a measly £200. Whilst this will be ample for most players, some will likely find it overly limiting. All told, the American Dad slot is a really solid title for all fans of the TV series. It’s silly, fun, and thanks to its plethora of bonus features, will probably delight many who are unfamiliar with the original content too. The top prizes might be somewhat low and the rare players who are used to betting four figures per spin won’t enjoy its £200 maximum bet, but for a casual few spins we can confidently recommend American Dad.